Prodigal and precocious getaway driver, “Baby” (Ansel Elgort) is working off a long standing debt to crime lord, Doc (Kevin Spacey), by using his talents behind the wheel to evade authorities and make some of the most amazing robberies in town possible. Now in for one last job Baby finds himself torn between his obligations to the crime world and new possible love interest, Debora (Lily James), where will his loyalties fall? Written and Directed by Edgar Wright, a hybrid love letter to the noir, heist, teen romance, pulp, action genres, this cinematic romp launches with some of Wright’s signature moves locked and loaded; the impossibly long and choreographed movie geek shot (opening credits), pithy dialogue, a soundtrack that crushes to the edit no doubt featuring some of Wright’s childhood favorites, and a solid first two acts that build to a “pull the pin and throw the grenade finish with all stops pulled.” Built around a solid cast that includes memorable performances from John Hamm, Jamie Foxx, the elusive well rounded female character does continue to slip Wright’s grasp as does a concrete ending point; regardless, a hoot and a half abounds none the less, and, for those willing to take the plunge, the price of admission is quickly paid off. 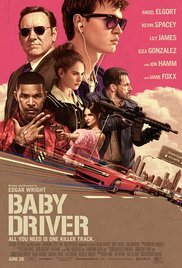 Baby Driver is rated R.